Viewership statistics display for Twitch, YouTube and Hitbox. Now you can see how many viewers your stream has from within Gameshow. Have a great weekend and please let us know in the comments what you think of these additions. If you have any issues with High-DPI display support in particular, please let me know what kind of video card and monitor you're using, and which OS you're running. I've gotta ask... what bugs were fixed/targeted for this release? If you are experiencing issues getting your Streamlabs (twitchalerts) or Web Display audio into Gameshow, you are not alone. We found a bug in CEF/Flash PPAPI that only affects Mac, and it can not be fixed properly until the 3.4 public release at the earliest, and potentially not until 3.5. The 3.3 public release should have a patch that disables flash on mac, which means no alert audio. To get this working, please rollback to version 3.2 of Gameshow. 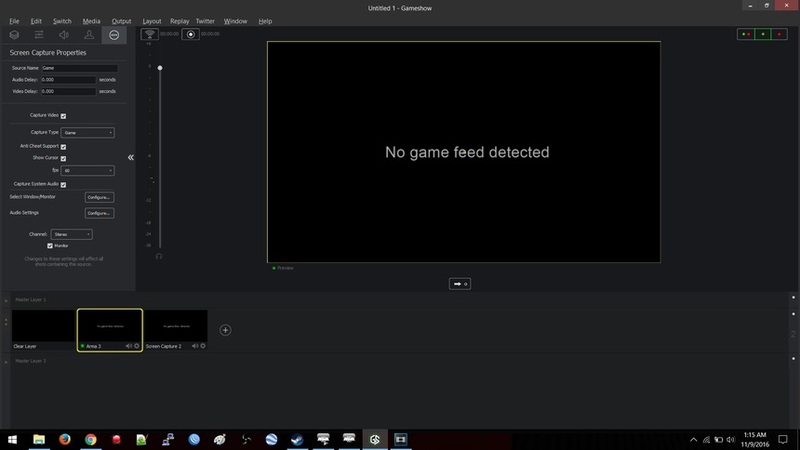 You will then need to download the Flash NPAPI plugin, in order to get the audio working for the Web Display and Twitchalerts in 3.2 of Gameshow (twitchalerts in 3.2, updated to streamlabs in 3.3). Once here, select your OS Version in step 1. Select the NPAPI option in step 2. You may need to reboot your system for this to take effect. i have a problem with the "Shut down web display sources" function. i use the web display option to insert a scoreboard in html format for fighting games. the scoreboard has an "fly in" transition that has to start every time at the moment when the scene gets live. The problem with gameshow is, that the html file starts the transition as soon as the scene gets in the preview window but it has to start when the scene goes live. Is it possible to change this in the options? in the past i used xsplit and OBS for streaming and there it is no problem. oh i forgot one thing. When I change the scene the HTML file shuts down after six seconds. It would be great if there were a option to shutdown the HTML immediately. We actually have already implemented this in 3.4! Beta due next week unless something stops it from leaving QA. The initial implementation of shutdown when inactive was just the shutdown ability. Then, we worked on having it re-initialize the source each time. If you pm me or post here a copy of the file/url, I would be happy to give it a shot on our internal builds to ensure it does work as intended. because i've some problem with arma 3, still no game feed detected. We checked in a few versions ago the ability to capture games that are protected by anti cheat software. What operating system are you running on? When adding a screen capture as a source, you will want to make sure the anti cheat box is checked. This should enable the hooking of games that have this software. Bryce Stejskal might have some more answers for this. im using windows 10 64 bit, and then this is my configure on gameshow. You will want to hit OK from that page, BUT if you look in the background at your screen capture properties, you should see that the anti cheat support box is not checked. You will want to make sure this is checked. It will be automatically checked if in Window or Monitor capture. At this point do you have Arma 3 open running full screen? Or is it minimized due to Alt+tab? 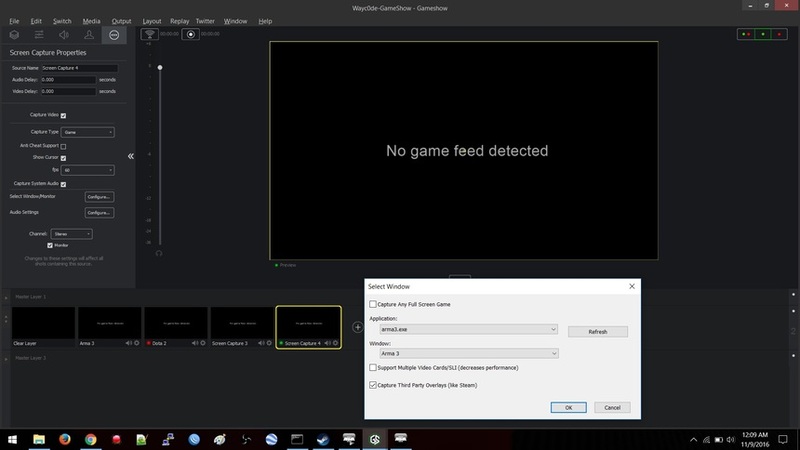 You will get this message if you are using the "capture any fullscreen game" and you proceed to alt+tab out, which minimizes the game, to check on Gameshow. Need a function to detect iphone when it's plugin for app on windows, player can record or live stream when they play game on iphone. Nguyen L Binh Not likely to happen. That is a function native to macOS and not Windows. Consider using an app like reflector 2. It is somewhat of the industry standard for doing that. Commonly used by streamers and content creators.